During our recent trip to Zimbabwe, I had the pleasure of visiting the Well Woman Clinic in Harare and was really impressed. They have facilities for cervical screening, breast screening and bone density scans. Screening is all about prevention. What do we mean by prevention of a disease? -Primary prevention is when the disease can be prevented by not being exposed to the causative agent. A classic example is asbestosis. If you haven't had exposure to asbestos, you won't get asbestosis. -Screening for any disease is an example of secondary prevention. You look for the disease early in order to improve survival. -Tertiary prevention is about prevention of the complications of a disease. For example, if diabetes is treated effectively, there is less chance of going blind. Mammograms pick up 85% of breast cancers. They can pick up pre cancer (DCIS) and are often combined with US. Tumours >5mm can usually be detected. However, breast screening is a complex subject and there are many aspects of the screening debate that I have raised before. Countries such as the UK and USA constantly review their policy. One sobering fact remains. Cancer can be missed by both mammograms and ultrasound. Mammograms in women with dense breasts are more unreliable: cancers are white on a mammogram. If the underlying breast tissue is white, a cancer may not be seen. Once you have gone through menopause, the breast tissue becomes less dense and so mammograms become more reliable. (This explains why mammograms are only recommended in women over 50 in Europe). Lobular cancer is less likely to show up on a mammogram. The woman may be reassured by a "normal mammogram" and so may present at a later stage. Lobular cancers are often easier to feel than to image. To have breast screening done properly, all women should have an examination as well as a mammogram. At the Well Woman Clinic, in Harare, I was really impressed to see that they combine clinical examination with a mammogram. There are 2 radiologists who work there: the founding partner, Dr Nancy Jonker, and Dr Maita Mvere. 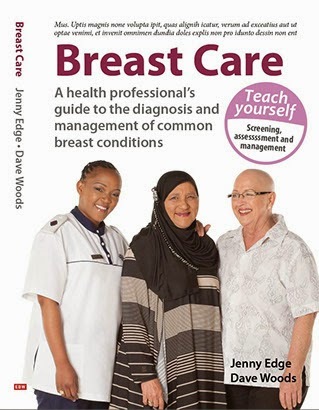 There are 4 clinicians (Dr Landman, Dr Mhlaba, Dr Cowper and Dr W Samaneka) who see all women prior to mammographic screening and determine whether/not they should have a mammogram. Although they work in the same building, they are independent and so will not refer a woman for a mammogram if they feel it is inappropriate. The atmosphere is relaxed and the ambience appropriate. The other health practitioners who are there include Miss Allaart (dietician). Ms Petra Mesu (psychologist), Ms Kathy Harter (social worker) and Sr Georgie du Plessis (SRN). Many thanks to Sr Riana Louw (practice manager) for taking me to the clinic.